Truth be told, a Christmas Carol has always been a part of Seanchai Library’s calendar from the year it was founded. However in 2012, and coinciding with the Dickens Bicentenary Year, Seanchai took the step from reading the story to presenting it in a 360-degree immersive environment designed to visually capture the essence of the novel, within individual staves (chapters) read by Seanchai volunteers over the course of several days, with visitor free to listen to the presentations, and then explore more about the life and times of Charles Dickens. Since then, The Dickens Project SL has reappeared in Second Life each Christmas, with new opportunities to enjoy the story, new events to share and more opportunities to discover the rich treasure of Dickens’ work, explore the lasting appeal of A Christmas Carol and learn about Victorian England from a literary standpoint. I’ve followed the project throughout, including the special 2013 virtual / live cross-over performance, featuring artists in Second Life and the physical world. For 2016, it is being hosted by Kultivate Magazine at their headquarters region on Water Haven, where an expanded set has been constructed, offering a broader, more immersive setting for the story, with supporting activities and events. While The festival officially opens to the public on Saturday, December 10th, I was delighted to be able to have a preview tour of the project with Cale, taking the opportunity to talk with her about this year’s presentation. To this end, and making full use of the half region put at their disposal by Kultivate Magazine, Seanchai have built a number of interlinked story and activity areas – Christmas Present, Christmas Past and Christmas Yet To Come / The End of It – where individual staves of the book will be read, Dickens’ writings explored, and entertainments presented. Each has its own look and feel, helping to immerse visitors more deeply in the tale. The event will be rounded out over the weekend of the 17th and 18th December with more music, the traditional Fezziwig’s Ball and The Big Read – all of the novel over three-and-a-half hours. A marathon it might seem – but one very mush worth hearing! “In all there will be 20 hours of events during the festival, ” Cale continued. “And the Community Virtual Library has created a Resource Centre to support us, where people can learn more about specific elements of the story: what was Tiny Tim suffering from, for example. We also have teleport portals connecting us to other themed locations in Second Life, such as Get Scrooged, at HKU’s Education Island.” A further addition to the 2016 programme is the Eight Days of Dickens mini-hunt. 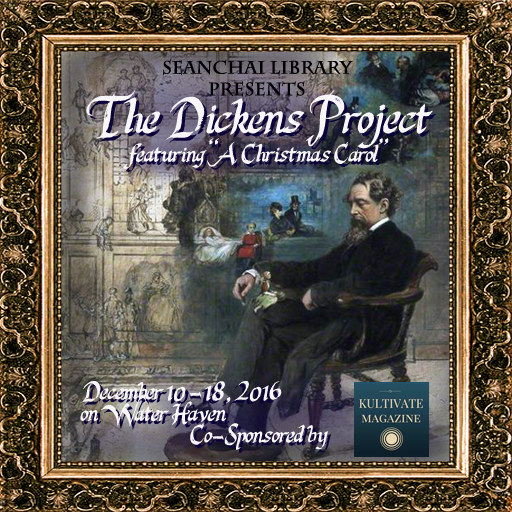 The Dickens Project SL is free to attend and explore. The twice daily readings are designed to help reach as wide an SL audience as possible, and will be presented by different volunteers, each giving his or her interpretation of the story and the characters, and visitors are welcome to attend as many readings as they wish. Donations will be accepted on behalf of Team Diabetes of SL throughout the week, to coincide with their Winter Showcase events. The annual RFL Christmas Expo opened its gates on December 1st, and will run through until December 12th. I’m not sure if it is me, but RFL events PR seems to have been a little low-key in 2016, to the point that this event almost entirely slipped my mind! However, if it had by chance escaped your attention as well, there’s still the weekend to make the most of it, and to hop over, explore the four regions, buy goodies, join in the fun and donate to RFL of SL. You can find details of participating creators through the Expo shopping guide, together with a schedule of entertainment, which include live performers and DJs, and there are fun activities such as photos with Santa, Expo sleigh tours, raffles, auctions and Gotyas still to be enjoyed, and much more besides, with all the details on the Christmas Expo website. A highlight of the Expo is the Holidays of Hope Ball, now in its 7th year, which will take place on Sunday, December 11th, from 15:00 through 18:00 SLT. There will be special raffle baskets for which tickets can be purchased, together with random door prizes, which in 2015 totalled almost L$50,000 in value, while the 2015 raffle baskets were each worth more than L$35,000 each and included items such as homes, designer outfits and L$5000 gift certificates among their goodies. Holiday formal attire is requested for the Ball, which will take place at the Polar Express Grand Station, high over the Expo regions. On Tuesday, December 6th, the Main (SLS) channel was updated with the same server maintenance package deployed to the three RC channels, comprising internal simulator changes. BUG-6377 – llGetObjectDetails(id,[OBJECT_ATTACHED_SLOTS_AVAILABLE]) – Returns a value that is number of attachment slots allowed by the server minus the number of attachments worn by avatar. Returns 0 if avatar is not in the same region or if UUID is not an agent. BUG-40871 – llGetEnv() constant “region_object_bonus” – returns the object bonus set for a region. The major news is that Bento was officially pronounced “live” on Monday, December 5th with the promotion of the Bento viewer code to de facto release status – see the official blog post or my covering article. Currently – and as far as I’m aware – Black Dragon has a release out supporting Bento, Cool VL viewer has had Bento updates in the experimental branch for some time, and both Firestorm and Catznip will be issuing updates with Bento support very soon. The announcement was followed with some further releases of Bento capable content on the Marketplace, and more will doubtless follow as Bento reaches more viewers and Avastar is fully updated (see below). Troy Linden, the product lead for the project, passed on congrats and thanks to all who have been involved in the project, and Vir Linden’s role in getting things rolling and taking responsibility for getting things to work in the viewer. One issue that wasn’t fixed prior to release was that of facial deformations occurring at altitude, which was noticed very early in the project. As this particular problem appears to be part of a broader issue of floating point calculation errors and it can be overcome by using hardware skinning, it wasn’t seen as a significant enough issue to warrant holding back Bento. Should you encounter it, try using hardware, rather than software skinning on your system. “unwearing” the default avatar while allowing baked textures & reducing the complexity of avatar bodies(see BUG-10980). Vir has previously indicated an interest in pursuing this idea (and the feature request has been accepted by the Lab). Splitting the avatar shape into different elements (e,g, head and body), seen as making it easier for users who are uncertain about customising their form using the sliders, or who have a No Mod shape associated with their head or body to be able to mix and match more easily. Avastar is still in the process of being updated to give expected support for Bento, and a new version is anticipated in the near future – users should keep an eye on the Avastar website for news. Cathy Foil believes that MayaStar is fully up-to-date, and while there have been reports of problems, these appear to be user error rather than bugs in the software, so she is considering further tutorial videos. Bento meetings will continue for a while (allowing for upcoming holidays). They may still be broadened into more of a content creation style meeting if there is sufficient interest. This is still TBD. The next meeting will take place on Thursday, December 15th at the Hippotropolis Camp Fire Circle, as usual, commencing at 13:00 SLT. slurl.com was officially retired on November 22nd, everything is now maps.secondlife.com – slurl.com/secondlife/ are redirected. Viewing a specific location on maps.secondlife.com no longer throws a 404 error in the console. Maps no longer disappear at peak use times. A large infrastructure update was made to secondlife.com along with security fixes and several minor bug fixes. The Marketplace had an Events infrastructure stabilization to fix a few listing bugs. A minor Security fix was released. The update also referenced the new Grid Status page service.